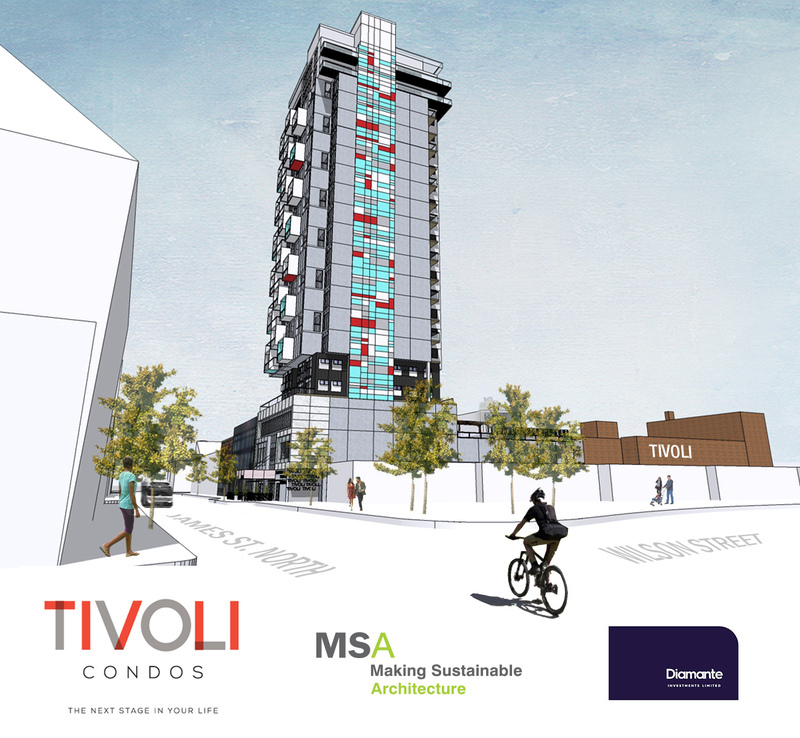 Last week Diamante Investments and MSA architects released their recent renderings of Tivoli Condos, a 22-storey, 106 unit, mix-use condo situated on James Street North. In many ways, the proposed condo is a daring design for the city. 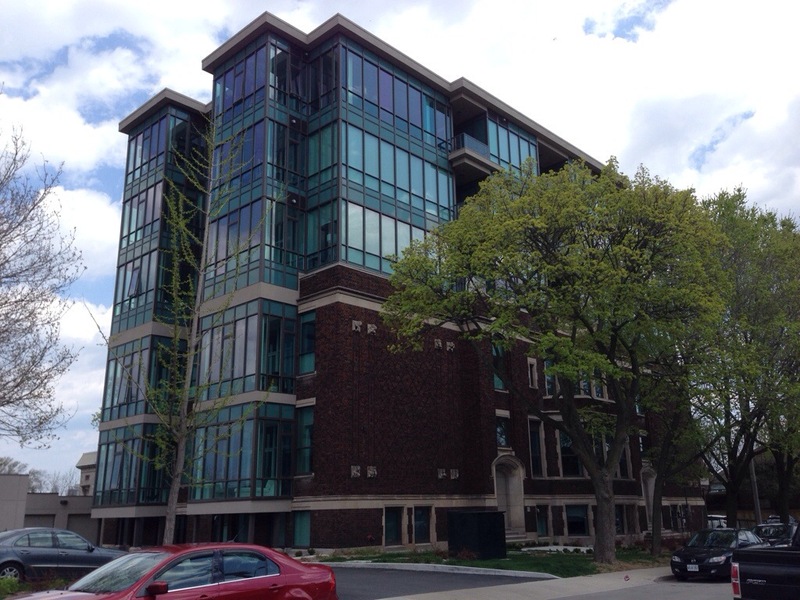 The building is a bold, new, and contemporary style of condominiums. However, the real daring in its design is its height. Like much of James Street North, the property is only zoned for three to six stories, meaning this development will require amended bylaws. The proposed amendments to change zoning requirements for its height, setback, and parking have sparked controversy. The arguments against the proposed changes are that the building will be out of context with the neighbourhood and could harm the downtown’s future development. 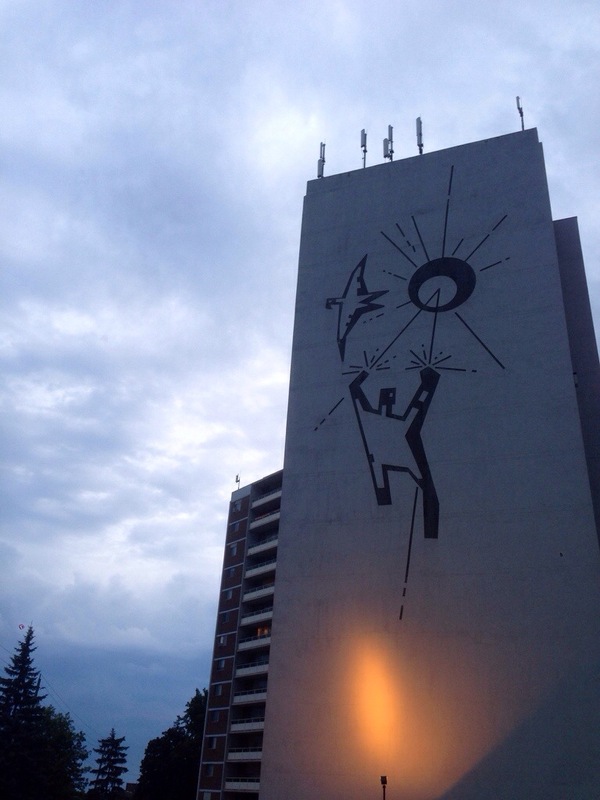 James Street North is in the midst of a revolution. A street of predominately three to four storey buildings, coffee shops, thrift stores, restaurants and many other small businesses have made this old cultural hub vibrant and popular again. It is unsurprising for the neighbourhood to be cautious of any development that might deadlock its progress. However, as this city gains momentum through potential investments like this development, changes are inevitable. As design evolves and infill is required to create density, regulations will need to change to accommodate the growth of a city. Heritage plays an integral role in the cities future, but it also shouldn’t be what slows it down. For years this city has seen an unchecked growth in sprawl, straining the core and hindering its economy. Now, as the urban pattern shifts, the city needs to think big. In order to intensify the core, the only way to build is up. The Tivoli Theatre proposal is far from out of context. A three storey commercial podium at street level, as well as the renovation of the old Tivoli Theatre, will not only connect the building with its immediate streetscape, but also add to James North’s walkability and commercial viability. The remaining 19 storeys of residential space are an appealing prospect. With the James Street North GO expansion, SoBi Hamilton Bikeshare, proximity to the Bayfront and its location on one of the hottest streets in the city, this development will have no issues finding buyers. As we build higher, we will see more people in the core, more business, more investment, and what’s most important to the city, more tax revenue. 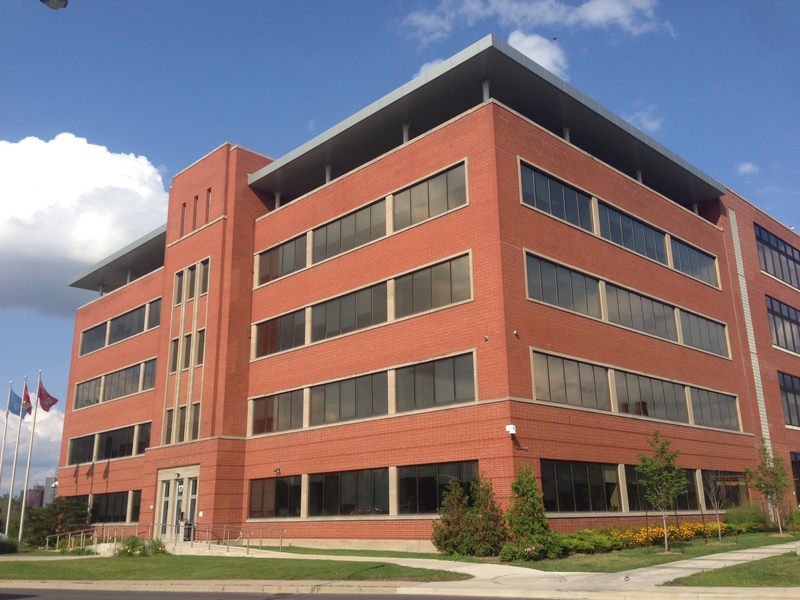 Kickstarting the renovation projects on Longwood Road South, the premier multi-tenant building at McMaster’s Innovation Park was The Atrium@MIP. 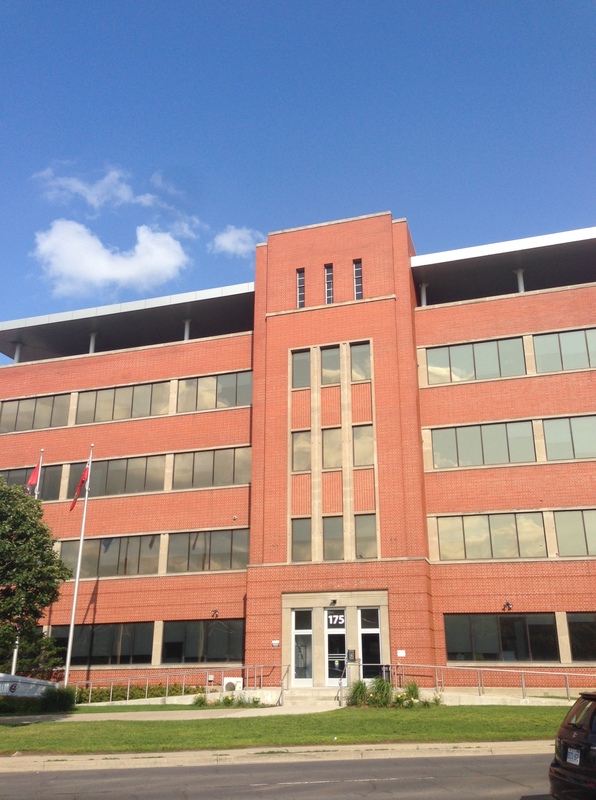 Updated in 2009 at a cost of $17 million, it continues to be a strong model of adaptive reuse for the many vacant industrial buildings throughout West Hamilton and beyond. 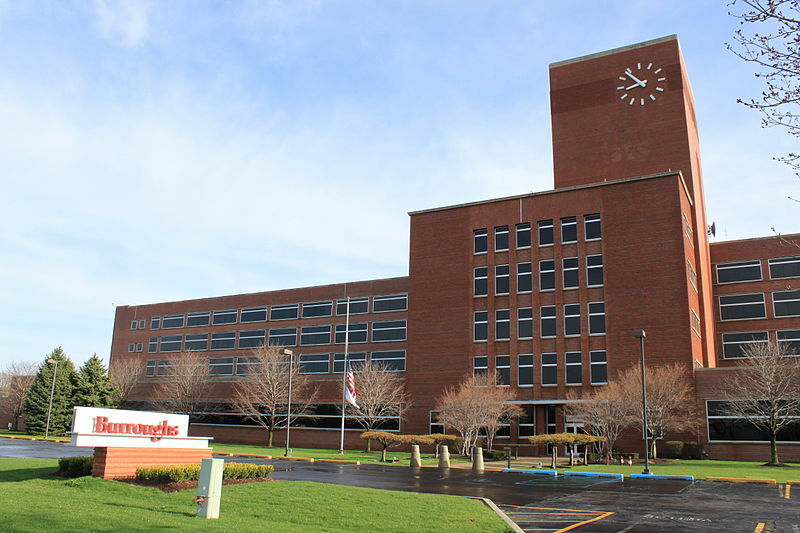 Formerly the Westinghouse (and later Camco) West Plant office building, it was completed in 1950 as a classic example of modern industrial architecture. Although it has been described as International Style architecture, this should be considered conceptually as a blanket term, rather than an example of a particular style. 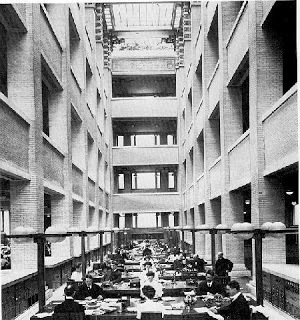 Designed by William P. Souter and Associates, the building shares similarities with Frank Lloyd Wright’s Larkin Administration Building and Albert Kahn’s Burroughs Adding Machine Plant. The floor plans of The Atrium@MIP interior shadow the classic Larkin Administration Building – in particular, extensive spatial unity and natural light. The newly renovated framework closely resembles Wright’s Larkin masterpiece, including an innermost light court providing natural luminosity to all floors of the buildings vertical layout. Though much smaller in scale, the surface of the building shares a similar composition to the Burroughs Adding Machine Plant. The red brick façade, stringcourses, tower-like entrance, and symmetrical windows echo the modern influence of the 1930s that inspired Khan in Plymouth. In 2005, extensive site reclamation of The Atrium@MIP began under the watchful eye of Lintack Architects. Immediately, the mechanical and electrical systems were replaced to increase energy efficiency throughout the entire superstructure. Then, interior partitions were removed to adjust to the new layout, providing better accommodation for a multitude of new offices and the addition of three new elevators. At the same time, advanced energy efficient and cosmetic upgrades were applied to the exterior of the edifice. Modern insulation, state-of-the-art windows, and an R valve roof coupled with two L-shaped aluminum clad canopies flanking the entrance provide a necessarily contemporary component to the sweeping facelift performed. 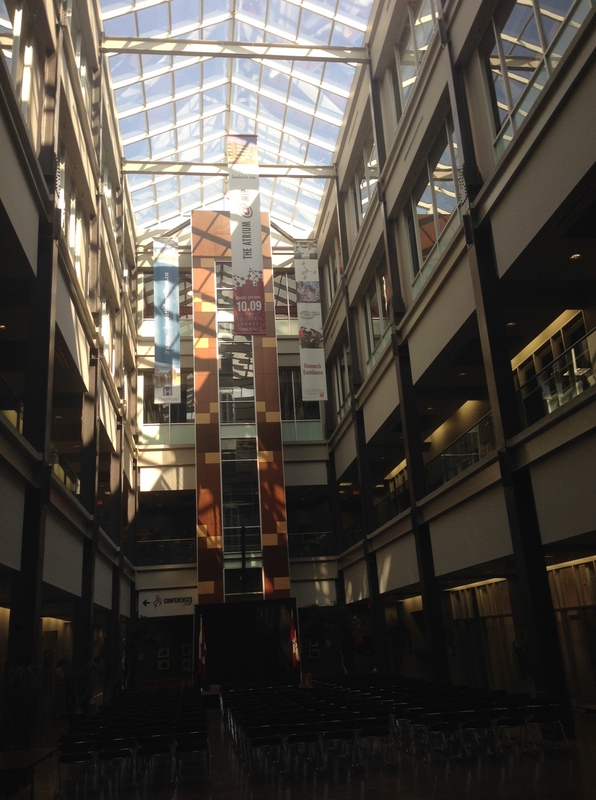 Leading the way, the Atrium@MIP was a rewarding project that may provide important lessons to further generations of reuse pending on various uninhabited yet promising sites in Hamilton. These idle but auspicious locations represent the spirit of Hamilton, centralized in an ambitious city and the history it carries forward.